Ka-Bloom! 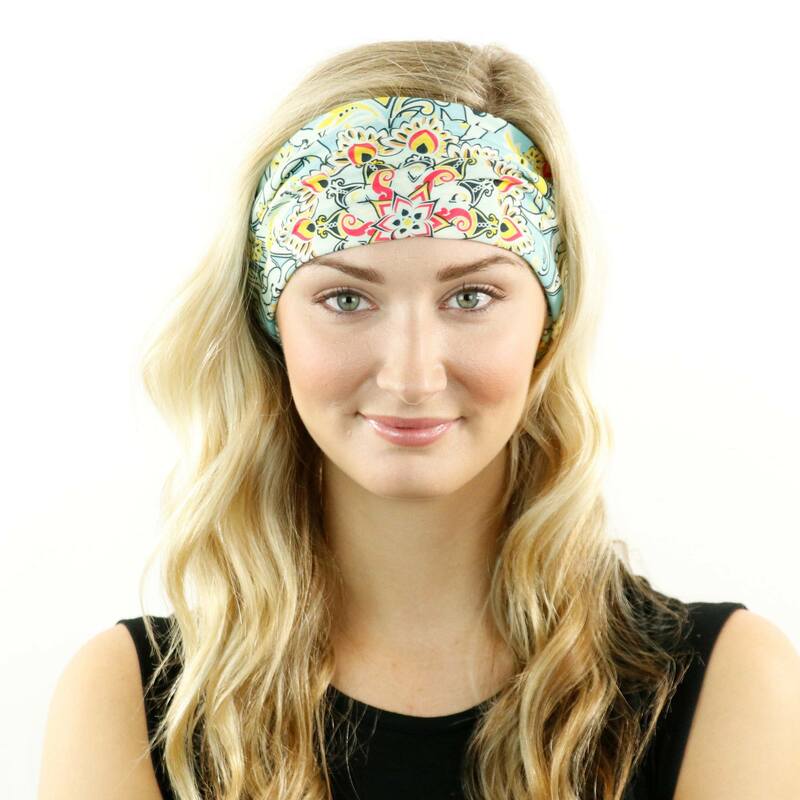 This floral headband features a floral explosion of turquoise, yellow, pink and orange. 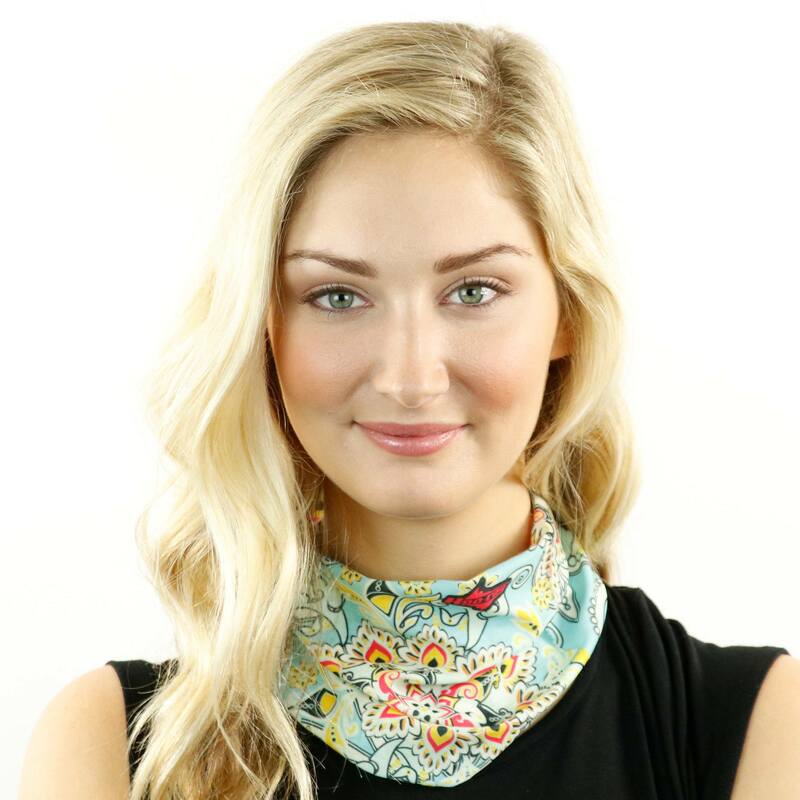 Avoid a headband headache when wearing this super soft multipurpose bandana. Sooo in love with all my Hoo-Rags I ordered! Prints are vibrant and my favorite part is they stay put. I don’t have to touch mine to adjust at all. I will def be ordering more! I used to buy a different brand and now I am hooked on hoorag! This print is beautiful and not too tight when working out. 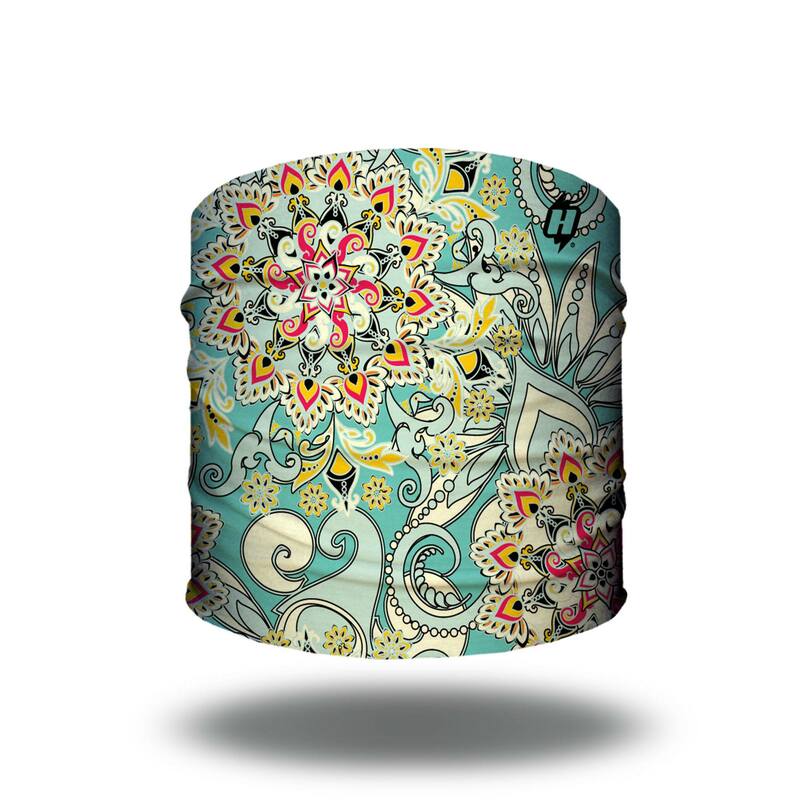 I love this pattern, it goes with almost any running outfit. It’s cute as a headband or I wear mine around my neck when I’m trail running or hiking. It keeps the sun off my neck and I can get it wet, to cool me down if it’s really hot outside. I ordered three half hoos and received 6!!! My daughter immediately snagged two of the ones I was gifted. She wears them as headbands, she is a dancer and when she wore one to dance it stayed on the whole time. It’s so pretty! I got a lot of compliments on it. The cutest design! I love it!! Love this!! Beautiful pattern, stays put, very stylish. This is the second half-hoo I’ve purchased I am enjoying both. Absolutely love my hoo-rag–my husband and I wear them when kayaking. Love the pattern and stays in well. Hoping they add more patterns comparable to this one. This design goes with a lot of my clothes. My favorite way to wear the half hoo, other than as a head band (which works great) is as an anklet or a bracelet. The ka-bloom hop is awesome! My husband just introduced me to HooRag a few weeks ago and I’m so glad he did. Running after two toddlers, boating, and getting a house ready to sell and move into=a beautiful messy hair life saver!!! 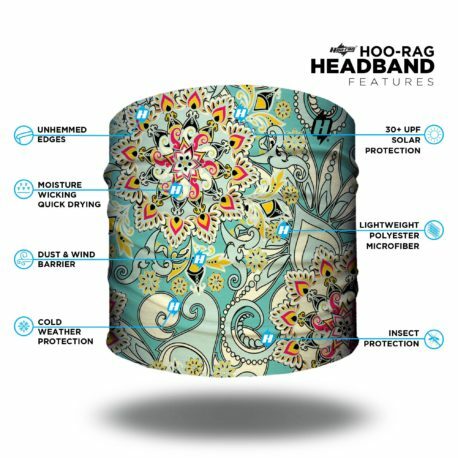 Major fan of Hoo Rags and the half Hoo’s are a great addition to the line..less bulk but same great quality as the reg Hoo’s. as an outdoor woman it makes me feel a bit girly without overdoing it.. I ABSOLUTELY LOVE Half Hoos! My fiance likes to ride, and I enjoy coming along. I’m definitely a girly girl, so I got tired of wearing his bandanas all the time. They are too manly for me! Hah! I came across Hoo-rags about a year ago, and have been a repeat customer. 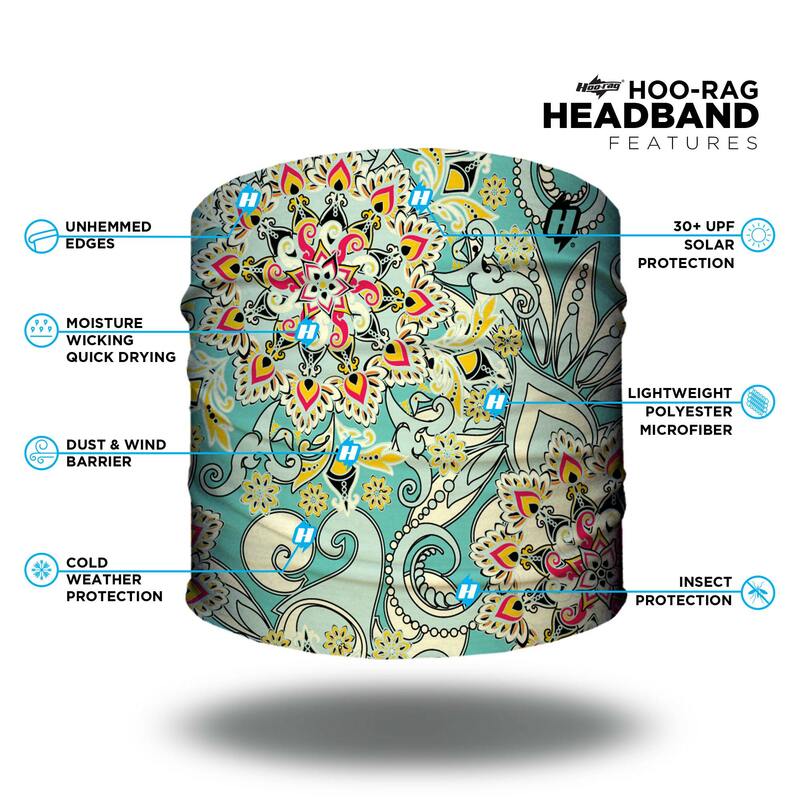 I use my Half Hoo’s on the bike to cover my hair and even my ears when it’s cold, at the gym, doing housework, or even when I just don’t feel like washing my hair and doing anything with it. I love this company and everything they stand for! You should definitely buy Hoos ALL THE TIME! I love, love, love this hoo! It has a fun print and seems like it goes with every outfit! Love my hoo rags! I have camo for hunting and some half hoos to add some fun when I dress down. They hold my hair back really well, especially when i take my dog hiking. My dog’s even got his own hoo too! They’re perfect! My new favorite headbands! I do yoga and I sweat. A lot. This Half Hoo is the perfect size to keep my hair and sweat out of my eyes. Plus, it is comfortable, lightweight fabric. And I love the designs. I have tried other headbands and these are by far my favorite.